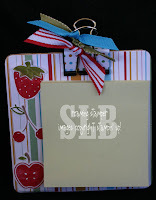 I just love the Tart & Tangy stamp set and the matching Summer Picnic designer series paper. It's just so cheery! Again, I used a square cardboard coaster for my backing. The top part is a medium binder clip that has been covered with the paper and ribbons attached to add some flair. All materials available from Stampin' Up!